for over 40 years. The Waterbury franchise has been under new ownership for 10 years now, since December, 2008, relocating from Prospect to Watertown. Overhead Door Company of Waterbury has been the garage door pros for over 4 decades. Our experience, resources, and superior customer service makes us the perfect choice. We are proud to be a local company serving the Waterbury area, as well as New Haven, Litchfield and Hartford Counties. We treat you like neighbors, because we are your neighbors! Our highly trained technicians have experience with many different overhead door styles & brands. They have the know-how, tools, & parts to install & service any garage door. Our mobile fleet comes to you for estimates, installation, & service. We respond to your requests quickly, and our service department is second to none! Overhead Door Company of Waterbury has the cutting edge tools & equipment to provide you with the best service. State of the art technology combined with old fashioned customer service. We have tons of styles to choose from. 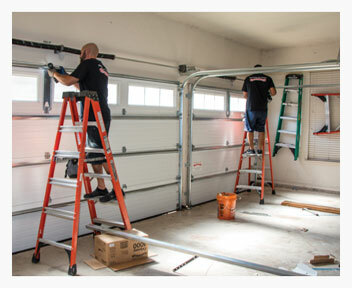 We come to you in New Haven, Litchfield and Harford Counties to install residential garage doors. 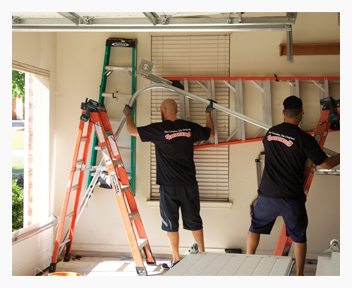 Our trained and experienced professionals will make sure that your garage door is installed efficiently and correctly. We service all garage doors, whether you bought them from us or not. Our fast mobile service can fix whatever problem you have. As always, we give you a free estimate on doors. Overhead Door Company of Waterbury sells, installs, and services commercial overhead doors for all businesses big or small. 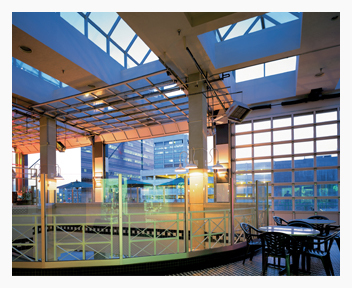 Our doors and storefronts are perfect for any business that receives or sends inventory, or for added security. We have a wide selection of commercial styles for you to choose from. Whatever your needs are, we can meet them. Whether you need large industrial garage doors or rolling steel doors, we have you covered. Overhead Door Company has been providing high quality loading dock equipment for decades. We sell, install, and service the equipment that keeps your business running. Some of the products we sell are: dock levelers, dock seals, bumpers, truck restraints, motion sensors, and more. We come to you for all loading dock equipment repair and servicing. Overhead Door Company of Waterbury responds to service calls within 24-48 hours, and we take care of your request as quickly as possible. We also have special 24 hour emergency service available for Emergency Facilities. We service both commercial and residential overhead doors. We have the trained technicians to work on all types of overhead doors, rolling doors, grilles, openers, and other accessories and parts. "Appointment same day i called. Installation less than 1 week later. Arrived on time, handled themselves professionally. Thank you Jack for helping us with our sale, and thank you Joe for the great install you guys were great!! " "What a great company! I recently had to have a whole new opener installed. From Wendy in the office to Steve who came out to install the opener, everyone was so great! " "Our cars were stuck in the garage after the spring broke. I went on their website and sent them an email at 10 o'clock at night and they called me first thing in the am and came right out and fixed it. Thank you!" "Todd was awesome!! Great follow up and great customer service. Thank you!!" "Calling Overhead Door Company of Waterbury was the best decision I ever made. The Job was Effortless and professional. And the most Friendly people. High quality service."